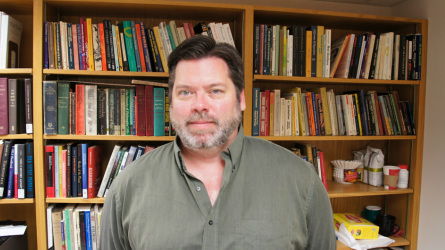 Robert T. Tally Jr. is an associate professor of English at Texas State University, where he teaches American and world literature, literary theory, and criticism. Tally is the author of six books, Fredric Jameson: The Project of Dialectical Criticism (Pluto, 2014), Poe and the Subversion of American Literature: Satire, Fantasy, Critique (Bloomsbury, 2014; named CHOICE Outstanding Academic Title 2014), Spatiality (Routledge, 2013), Utopia in the Age of Globalization: Space, Representation, and the World-System (Palgrave Macmillan, 2013), Kurt Vonnegut and the American Novel: A Postmodern Iconography (Bloomsbury, 2011), and Melville, Mapping and Globalization: Literary Cartography in the American Baroque Writer (Continuum, 2009). Tally is the editor of six collections of essays: The Routledge Handbook of Literature and Space (Routledge, 2017), Ecocriticism and Geocriticism: Overlapping Territories in Environmental and Spatial Literary Studies, co-edited with Christine M. Battista (Palgrave Macmillan, 2016), The Geocritical Legacies of Edward W. Said: Spatiality, Critical Humanism, and Comparative Literature (Palgrave Macmillan, 2015), Literary Cartographies: Spatiality, Representation, and Narrative (Palgrave Macmillan, 2014), Geocritical Explorations: Space, Place, and Mapping in Literary and Cultural Studies (Palgrave Macmillan, 2011) and Kurt Vonnegut: Critical Insights(Salem, 2013). Tally is the editor of Spatial Literary Studies, a special issue of Reconstruction: Studies in Contemporary Culture 14.3 (2014) and Spatial Literary Studies II: Problematics of Place, a special section of Reconstruction 14.4 (2014). The translator of Bertrand Westphal's Geocriticism: Real and Fictional Spaces (Palgrave Macmillan, 2011), Tally is the general editor of Geocriticism and Spatial Literary Studies, a Palgrave Macmillan book series.